It certainly helps if you own a killer domain like “Ireland.com.” UK based local search aficionado Dylan Fuller alerted me to the new Ireland.com, which is owned and operated by newspaper The Irish Times. Ireland.com used to be the Irish Times’ site, which it has now moved here. 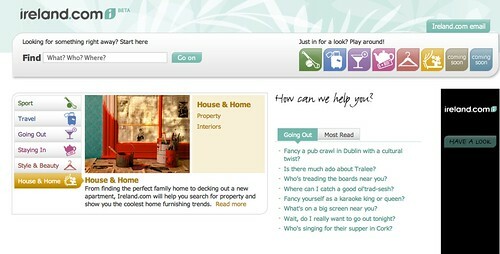 The Times operates Ireland.com as a portal for all-things-Ireland. And it represents something of a model for newspapers that can branch out and diversify to offer other content and capabilities on secondary sites. In the case of Ireland.com, this is an additional distribution outlet for newspaper content and ads. It’s also going to be able to attract advertisers that might not advertise in the newspaper or on the newspaper site. This entry was posted on June 30, 2008 at 5:46 pm and is filed under Classifieds, Europe, Local Search, Newspapers, Verticals. You can follow any responses to this entry through the RSS 2.0 feed. Both comments and pings are currently closed. Interestingly enough, guy who headed up launch and current management is an ex Sensis and World Directories/(Truvo) yellow page guy… Australian, Vaughan Bellamine. The new ireland.com site should be used as a great example of how to develop a local/geo site and a viable strategy for newspapers in the local space. They are leveraging the “killer” domain and turning it into a world class brand. I think Vaughan has brought a lot of knowledge and experience of what does and does not work for this type of site, especially in a smaller market (by small I mean Ireland is less than 5 Million people online and the online ad market is still developing). It is also interesting to note that this site can server people in Ireland as well as Irish ex-pats, people of Irish decent and people planning to visit (tourists). Ugh poor HTML – why can’t they learn how to use CSS sprites etc.